Add-on pocket is designed for use on the Buddy Lobby Sign Holders. 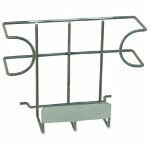 3" deep pocket attaches to the sign holder stand to display literature. Pocket is made of steel with a powder-coat finish.